For us it was a long process that was very good from start to finish. The Arcahdeck team is professional, thorough and very pleasant. We would highly recommend Archadeck to anyone who wants a quality project. Great customer service, design professionals and contractors! Very happy we went with Archadeck. The experience was amazing from start to finish. From when we start to think about redoing our deck to the point when it was finished. I couldn’t speak more highly about this experience. Done a fabulous job! The folks from start to finish were very courteous, professional and fun to work with. Just keep up the great work! Lisa was professional and patient during the whole process. Dawn was also professional and communicated all the steps of building very well. The builders did an amazing job and were friendly and professional. The follow up to make the deck perfect was timley and thorough. From design to finish everything was very well communicated and we couldn’t have been more happy with the finished product. The workers were prompt, hard working, professional, detail orientated, and nice to talk to. It was an excellent experience from start to finish. The professionalism and expertise at all phases from design to construction to completion was outstanding. Sara at Archadeck did a great job! Especially with production dates, and completion of work done on time. Great Experience! The project more than satisfied with results. Working with Archadeck was a great experience! Very professional. Help me capture my vision, then delivered! Great communication. Clean work and I didn’t have to keep following up. You get what you pay for. The installers did a great job. If there were any issues, they were resolved right away. Everything was great! Took the crew only 3-4 days to complete. We received daily updates. Great to work with Archadeck! The sales process was low pressure, really work with you to find the best solution and worked through many options, always friendly and happy to do so. Quality of our very high deck is top notch. Any small revisions and fixes addressed quickly and willingly, would definitely use again and recommend. Everything went as planned and the new deck is beautiful! Juan and his crew demoed the first day and began to lay the patio base. Day two they worked on seat wall and patio and by lay three project was complete. They worked so hard and efficiently. We were so surprised how fast they power washed and planted grass and left all our flower beds and mulch and looking pretty. Loved it! Juan was very friendly and went through everything step by step with us. Everything was neat from digging up the grass and dirt to laying gravel and brick. We love our new space and will recommend to all our friends. The crew was amazing! They were on time, friendly, open to questions, and efficient. The deck is spectacular! I got daily updates which really helped. Excellent customer service from everyone throughout the project ! Excellent company and crew. I would highly recommend them. Great experience from the initial sales visit through construction and completion. Went fantastic. The builder kept us informed on the project daily. Kept the work area clear of any debris. Built a beautiful deck in less than one week. On time, worked hard, cleaned up. Excellent crew. We made a couple of changes mid-stream and it still was on time and in budget. I received daily email updates with progress reports and answers to my questions. Excellent firm. Great on time and very quick. Love the result. Lisa was amazing, the actual project went so much faster than anticipated, and in the end is absolutely beautiful! Wonderful! Sara designed our deck exactly how we wanted it. Construction workers finished it beautiful! Very professional, from initial planning to construction to final product. Everyone we had come in contact with was very helpful and responsive. Couldn’t be more happy and satisfied. Marek, Juan, and Lisa are all examples of professionalism. From start to finish everyone we came in contact with was proficient, polite and a pleasure to work with. The job was done by the installers who seemed to enjoy their work. The job was done in less time than was estimated. The finished patio is just beautiful! Workers were very professional and took pride in their work. They were open to suggestions when given and understood what I wanted. The overall look of the deck was fantastic and I’m proud to show it to family and friends. Everything went according to plan – the project was finished early. Workers get an A+. All contractors were great. The project manager Tyler was terrific. I am so pleased with their work! Last year, they built a 3 season room for me. This year, a deck, patio and walkway. Will call them for the next project. Lisa came out to meet and talked through what we wanted and showed me design concepts. Was helpful, listened, and produced drawings to reflect what I wanted. The crew was amazing. Very friendly, polite and efficient. Our fire pit and wall look beautiful. The crew was always on time (actually finished the project ahead of schedule), always professional and polite, and seemed to work very well with one another. Kristen is creative, receptive, and easy to work with. I value her ideas. The crew was friendly, professional, hard working, and excellent at their craft. From the start of working with Archadeck and our design consultant to the final aspects of installation, our experience was fantastic. The results exceed our expectations and we love our new patio. We highly recommend Archadeck. From beginning to end, every step of the process was handled in an extremely professional manner. Archadeck was a pleasure to work with – and our porch is beautiful! The workers were excellent putting the pergola up! They were polite, cleaned up, and were master craftsman as far as I am concerned. We could not be happier with our experience with Archadeck. Beautiful design! Very professional from start to finish!! Archadeck did a great job. They listened to our needs and were flexible when we would change what we initially thought we wanted. The employees were friendly and did an excellent job! The project went smoothly. Very happy with the completed portico. Excellent – great work from start to finish! Very good, very organized, quality work, and very responsive. Excellent job from design, planning and execution. Great communication and very professional. From start to finish, Archadeck was the most professional, courteous, timely, and phenomenal group of people to work with. The constantly kept us informed of the process and progress of building our beautiful 3 season room. Sad that we don’t have anything else (projects) to do with them! The entire project was very organized. Communication with Archadeck continued throughout construction. Very professional. The deck is beautiful! Dan the carpenter was on time and the work was excellent. We were very pleased with the detail of all the work on the project. What a pleasure! They were prompt and highly professional watching them work was a pleasure. Love the result! Did not expect to use archadeck, but when Maggie showed us the detailed plan, we were floored! Subcontractors were on time, professional, and cared about making us happy. We are very pleased! Overall, Archadeck exceeded our expectations. The quality of the work was outstanding and was performed on time and on schedule. We received daily updates via email from the office, which was again beyond our expectations. I would highly recommend Archadeck! Our experience with Archadeck was amazing! The crews were professional and took great pride in their work. They managed the project from beginning to end, making it easy for us. The project went very well. It was done on schedule and looks amazing. Archadeck was very responsive to our needs. Was very pleased because the project went ahead of schedule! Project crew was phenomenal! Daily update wonderful. Excellent job! Highly recommend! I have already received numerous compliments and inquiries. Design – even small projects get high quality, interesting plans. Build – this is the only contractor I have worked with that actually does what they say and what a contractor should do. They keep you up to date on progress and any issues. They respect you and your property. And they ultimately install High quality projects. We are very pleased with Archadeck’s workmanship. Great design and execution! Highly recommended! We had a great experience with Archadeck. Dave informed us in advance of what to expect from the process of installing a new patio and it all happened as outlined. His crew was diligent and polite. We highly recommend Archadeck! Just perfect! No aggravations, very satisfied. Overall we had a very pleasant experience. Archadeck was very professional throughout our entire experience. We are very happy with our deck and plan on using them again for our patio. They were professional, easy to work with, very thorough and completed the job on time. We’d highly recommend them. The project was very well managed and produced great results! Overall experience was fantastic. Archadeck was very open to all of our questions and exploring options. The carpenter, Chris, Was always on time, very professional, and paid attention to every detail. We love the end product and would recommend Archadeck to anyone looking to build a quality deck. Very professional to work with, project was top quality, excellent construction and followup, finished project was outstanding. Beautiful job – Chris was a hard worker. Project went well from start to finish. Very professional with solid workmanship. The very few, minor problems were handled quickly and easily. The excellent planning process and informative design work. Finished in three days with no delays. Very happy customer! Great job, excellent time management and ongoing feedback throughout the project. We are extremely happy with the patio project. Workers were punctual and the job was completed on time. Quality is excellent and all questions were answered. The whole process went well. Reasonably priced, very helpful with design, great communication, love the patio, terrific experience overall! 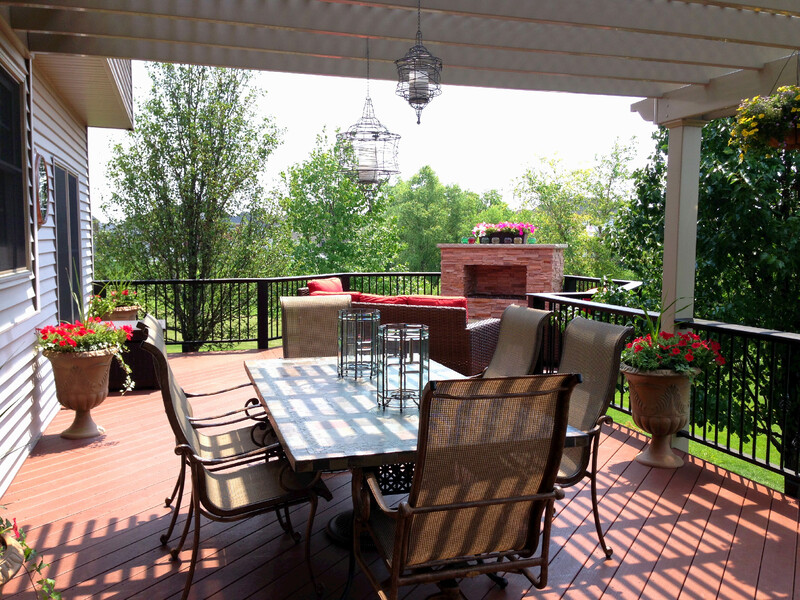 The deck was done meticulously and the builder was timely, polite, flexible, and a pleasure to work with. Archadeck was an amazing company to work with and highly recommended. We just sold our house and moved into a new house. The thing we miss the most was the beautiful deck that we left behind built by Archadeck. That’s why we chose Archadeck to build a patio with a pergola at our new home. It turned out beautiful! The crew removed old deck and landscaping, replaced with stone patio. Always on time, courteous, very considerate, and responsive to questions and concerns. Easy company to work with. The crew that performed the work were very efficient and clean, the job site was cleaned every day and left neat. Archadeck’s deck and patio completed my backyard, giving me the equivalent of two more handsome rooms. Hidden support construction on the deck and underground drainage assure me that the structures will last a long time. We had a good experience on their crew and management. Deck and patio was completed on time. Workmanship was superb. I could not be happier with my new deck. It was a pleasure from beginning to end working with all the people from Archadeck of Chicagoland. John showed up and paid great attention to detail and kept the work area nice and safe for my kids and dog. Excellent job from start to finish. The job was done in a professional manner and all employees were very good to work with at all times. Dave was excellent to work with, provided good suggestions, and communicated well throughout the entire process. We will use Archadeck in the future if the need arises. Excellent! Very professional, great communication, high-quality work, and delivered all expectations. I highly recommend Archadeck of Chicagoland. Extremely organized and provided visual images via iPad. The carpenters were awesome and accommodating to our every need throughout the entire job. Great job! We are delighted with the outcome of our screened porch. It had a complicated roof line and Archadeck did an exceptional job. Great experience from start to finish. Great communication, polite and skilled workers. We are very, very pleased. Archadeck was easy to work with and we got a great quality deck! Kristen and the Archadeck team were very professional. They completed the job in less time than planned. The finished deck looks great. Wonderful craftsmanship and excellent customer service! I couldn’t be more pleased with my new deck. Kudos to Kristen for walking me patiently through the process from design to completion. The crew of 6 guys arrived on time, and worked hard all day. Sent an update to us within an hour telling us what has been accomplished and when they would return and finish. 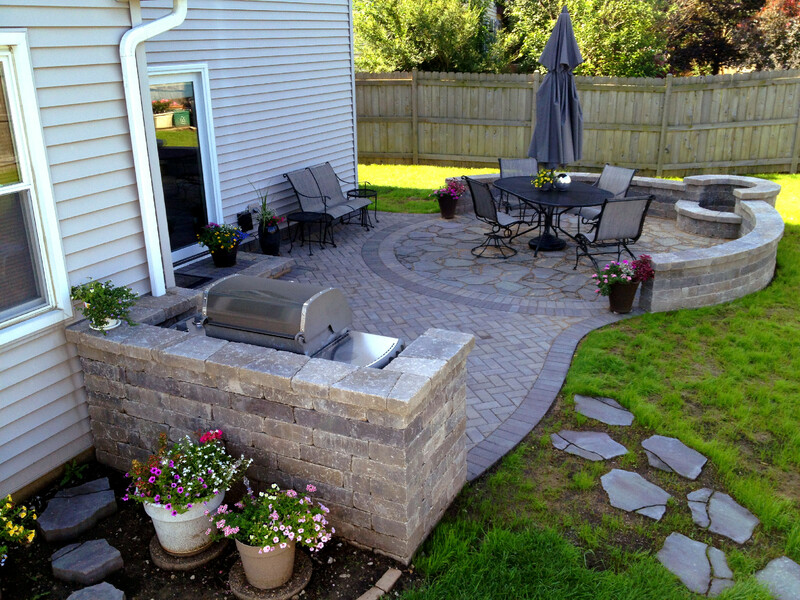 We added a large brick patio and a fire pit with a seat wall. We were able to use some existing pavers and incorporated them into the design. We are extremely happy with the results. The patio turned out beautifully. The professionalism of the crew was impeccable, as was their work ethic! Kristen came out to the house and presented different options. We were impressed with her knowledge and professionalism. Christian built the deck within 5 days and we’ve gotten great comments from our neighbors and have really enjoyed the well built, high quality deck. Archadeck made our dream of building a deck a reality. The customer service and support from start to finish was excellent. All concerns and questions were addressed and remedied immediately. Archadeck was professional and helpful from the beginning to the end of the process. The final product turned out excellent! The project went very smoothly. The communication was great! I liked getting updates at the end of the day of what was completed. Very professional and the deck looks amazing! So glad we chose Deckorator Pickets for the railing. Great experience from start to finish. Professional – everyone was pleasant and nice to work with. Appreciated all the communication and updates. The job was reasonably priced. Crew working was absolutely wonderful to work with. Answered all of our questions and concerns immediately. Would definitely refer to friends and family. Our job was great. We have used Archadeck on two previous projects and they were perfect this time as well. Very professional and easy to work with. The entire team was first rate. The overall design was perfect and they were able to make ongoing changes throughout the project. The team on-site was fantastic, reliable, and clearly knowledgeable about products and project! From start to finish, the process was very detailed, professional, and smooth. No surprises! Great workmanship and communication. Highly recommend. Alex and Dave were very professional and courteous. Workers were on time and cleaned up properly. Great job! Great service! I would recommend! The carpenter was excellent who did custom railing for us. Overall, the staff was a joy to work with. Great group! From the initial contact with Kristen on the last visit after completion, I would say they did a superior job. The patio is beautiful and the crew was great. We are extremely happy. Crew was timely and the end result was great. David and Kristen were a dream to work with. Archadeck is a company with integrity. They stand behind their work. Paul, the carpenter, was here every morning at 8 o’clock sharp. His work was excellent. The deck was even nicer than we expected. I would recommend Archadeck to anyone. Easy to work with. Did what they said they would. Positive example. Would recommend to others. we had a positive experience from start to finish. The craftsmanship is top notch, the responsiveness of everyone was awesome, and the level of service, quality, and attentiveness to me as a customer far exceeded any experiences with other contractors I’ve had before. The entire process was positive – the setup and planning, the actual work, and the workers were effective, efficient, and quite cordial. I would recommend this company and it’s employees to anyone thinking about adding a deck. The crew was efficient, polite, and explained everything when asked. Total job was completed in less than 3.5 days. Professional experience from beginning to end. 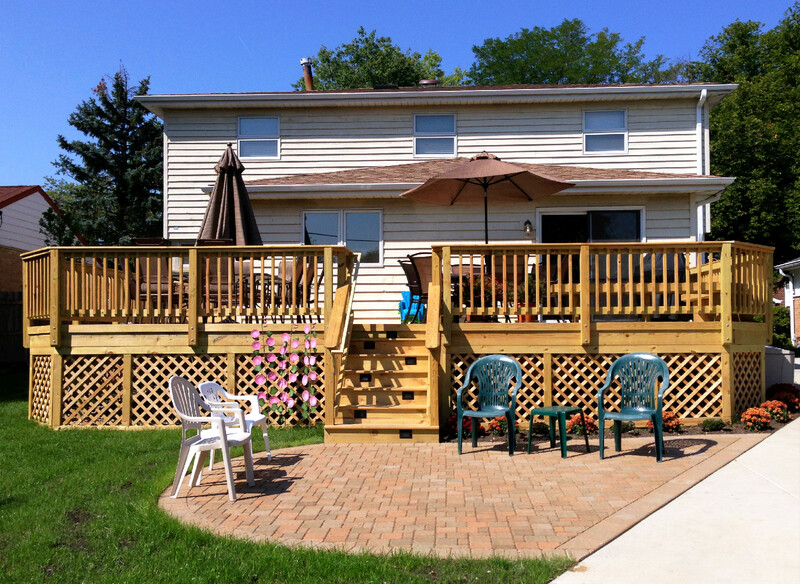 Lots of communication and a beautiful deck was designed and installed. From design to finish, Archadeck was top notch. Can’t speak highly enough about the team…especially Paul. Highly recommend to anyone. Archadeck is an amazingly fine-tuned group of people that did everything they said they would do when they said they’d do it. Wanted to replace the old deck and wanted low maintenance and they suggested a patio – which turned out to be great! We love it! Very professional, hard-working crew. Great work with an eye for detail. Entire process was perfect from start to finish. We knew what we were getting, but the results surpassed our expectations. (We) would use and recommend this company again and again. Great experience; worth every penny! Design meetings went well, the work was done very well and in a reasonable time. The whole experience was great. Christian did a fantastic job and always had a great attitude. Very reliable company, they made the experience easy and fun! From start to finish everything ran smoothly and efficiently. Great people to work with. No surprises. Looks better than we thought. Workers were very professional and efficient. Great experience! Would work with again. Will look to them when we have future projects. First class service. I was updated daily on our project. We will use them again. Built on time and on budget. All subs were pleasant to work with. Juan Islas and his skilled crew were wonderful people to work with. A+ is their overall grade. We even had an instant picnic at the end of the project. We were so happy we had Archadeck of Chicagoland to do our project. We are very happy with our new porch. The workmanship is great. Very professional. Excellent! Paul was a superb craftsman. Very nice quality. The crew was professional and quick. The entire team was great to work with. The workers on site were respectful of my property, ensured the site was always clean and responded quickly to any questions I had. I would definitely choose to do another project with Kristen and her team. The entire project from start to finish stayed on schedule and exceeded my expectations. Great from beginning to finish. Would recommend to family members. Project was performed as planned, carpenter did a great job in a total. Custom screens caused a small delay, but overall we were extremely happy with the project. We are extremely pleased with our new paver brick patio. Wonderful company to deal with from start to finish. The crew was here on time every day and worked extremely hard. I would recommend to everyone. Every person we dealt with was professional, friendly, and accommodating. The project was finished before we expected. We’re thrilled! Crew was professional. Company was very responsive and addressed issues immediately. The entire experience, from start to finish, was excellent. The design and workmanship exceeded our expectations. Excellent company that we would highly recommend. Everything was amazing. From the first call to set up possibly using them as our company to the very end. Incredibly Organized and great communication. Highly recommend!! From quote to final inspection, Archadeck was fantastic to work with. The porch they designed and built is the envy of everyone who sees it. Every step of the process. from design, to get the permits, through the build, the Archadeck owners and staff were very helpful in explaining everything and did a professional job. The patio and pergola turned out wonderful!! John did an amazing job. He worked hard and long hours. The company called each day with updates and explained all the progress and upcoming work. We were so impressed with Archadeck and John and would recommend their work to anyone. We are very happy with Archadeck. Quality construction and daily updates kept us informed throughout the project. We highly recommend! Archadeck of Chicagoland designed the perfect deck for my space. I had a lot of specific requirements, and all were met. The finished deck exceeds my expectations. Thank you David and Kristen! We really enjoyed the entire process of having our deck built-it all ran so smoothly. We’d do it again in a heartbeat. 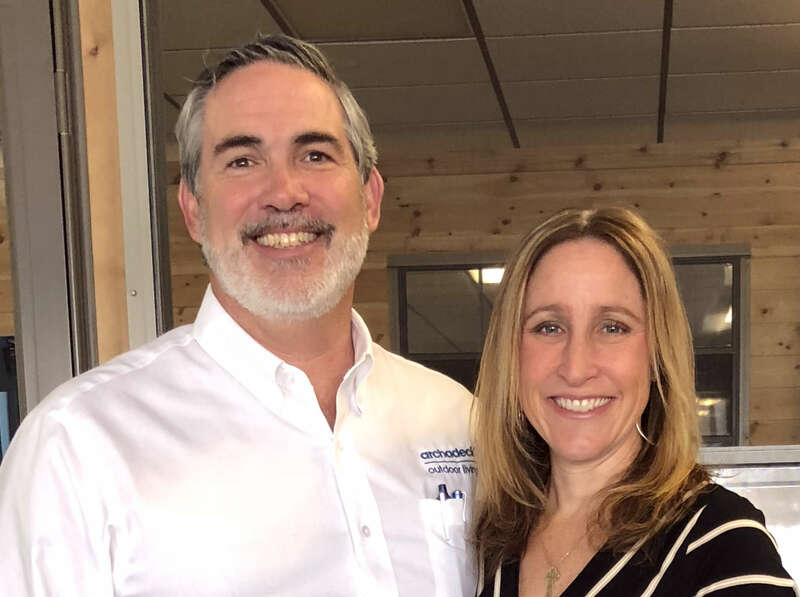 Dave Berryhill was everything one could ask for in a contractor: professional, courteous, informed us of each step and process, went above and beyond, personable. Have had bad experiences with contractors in past and Dave was by far the best we have worked with, and worked hard to earn our business. We would recommend David Berryhill / Archadeck to anyone in a heartbeat. The other people who came to offer bids either had no ideas or tried to impose their aesthetics. 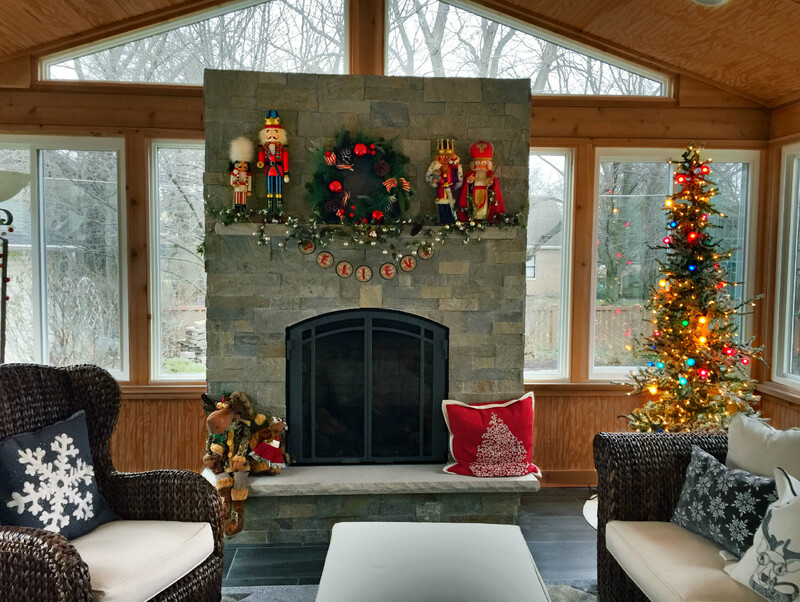 David worked with us to find a design that suited our house’s style, the yard, our lifestyle, and our budget. He treated us courteously and respectfully and his crew fulfilled every promise he made. If only other contractors did business this professionally! Smooth process from start to finish. Daily updates kept us informed. Crew was fantastic and kept the site clean. Dave Berryhill was an excellent consultant who helped us visualize what our room could be and offered valuable advice as we settled on a plan and finish materials. Paul and Keith – the construction crew – were extremely professional and outstanding in their willingness to keep the job moving through some incredibly cold stretches of winter weather. Their attention to detail – even suggesting small improvements to the design along the way – was obvious throughout the construction process. While Dave’s team offered to handle the siding on the room, we opted to use the contractor who had resided our house just months before construction began. The siding contractor commented on the quality of the work and how knowledgeable and collaborative Dave, Paul and Keith were in sharing information and coordinating schedules. Dave was an extremely good communicator throughout the building process, promptly answering our questions, accomodating a few changes along the way and keeping us updated on progress and the occasional delay – mostly related to sub-zero weather. We now have a fabulous looking sunroom and deck that has received nothing but rave reviews from neighbors and friends who have seen it. Everything – from Dave’s original design consultation to the Paul and Keith’s workmanship – was top notch. Of all the projects we’ve dealt with, this went the smoothest. Dave is a professional and stands behind his design. Workers issues were dealt with to the customers benefit. Great job. From design to build David Berryhill and his team did everything we had hoped for. They were professional and the craftsmanship was excellent. Very pleased with all aspects of construction! I appreciate his willingness to make a few minor changes / corrections at completion to assure total satisfaction. If and when we move again, we will be Archadeck customers. We are totally satisfied with this project. The design was super, the workmen great, and the deck turned out PERFECT for us! We liked the firm – especially Kristen and David Berryhill. Lovely people! Quality work! Dave Berryhill was professional throughout the process and stayed involved during the entire construction process. The building crew was also very proficient and neat from beginning to end. Dave was wonderful to work. He was prompt to return calls and handle any issues. He was always professional and very nice. I won’t hesitate to hire him again to do a project. It was so nice to have someone who was concerned about the quality of the room and our happiness with it, instead of just hurry, get it done and give me the money. David Berryhill is a very thorough and competent professional. He does and performs what he says! I would refer him to my dearest and nearest. This was a great experience – from start to finish. The owners, Kristen and Dave, were great to work with. The crew, led by Fabian, were outstanding and easy to work with. We were also pleased with the company’s office staff who sent us daily updates. We’re very happy with finished product. We encountered problems but they were resolved to our satisfaction. Mr. Berryhill was great to work with and did correct any problems we had. We would gladly recommend him to our other friends. Brian and Frank (carpenters) were also a pleasure to work with. We appreciate the craftsmanship and professionalism by you and the expert team that installed our new rail system. Thanks again for a great job! From our first meeting, through the design and build phase, we just loved working with Archadeck. They were prompt, helpful and did a beautiful job. Dave did a great job keeping us informed, getting permits and returning calls… I would recommend Archadeck to anyone looking for a contractor. From start to finish, I couldn’t be happier with the entire project! The time that it took to complete the project was well within our expectations. I would recommend this company to ANYONE. Gus and I wanted to, again, thank you and your team for the awesome deck. We are really enjoying the extra living space. Folks that walk by also express their kind thoughts about the great deck. Take care, enjoy summer, and be well! Top notch company in all respects. Beautiful finished product and David was a complete professional and very easy to work with the entire project. He went above and beyond expectations many times. Thank you! All of the Archadeck employees were very professional and on time. They were very responsive to my questions and any follow-up issues. Did a great job on the deck and patio. It looks fabulous! Excellent services and responsiveness. Reviewed progress regularly. On time and on schedule. Love the outcome. Great job. Very professional and took extra time and effort to do a great job. Good crew. Friendly and neat. We’ve had so many compliments as the process went forward. We love our new porch. Definitely, recommend. The workers did a very good job. They cleaned up the site and we are very happy with the work. We got a fast response and install. The entire crew and company were easy and great to work with. We’re thrilled with the quality and service. Archadeck listened to us and created a plan that worked really well for us. We are thrilled with our new patio! The crew was very professional, on time, courteous and neat. Great job! Dave was a true partner in the project including innovative design ideas. The quality and workmanship were highly satisfying. Great job. We’re very pleased with the work and design. Thanks, Dave! Excellent! Great experience from start to finish! Great vision in helping us pick out the right patio to fit our needs. Very good to work with. Excellent craftsmanship! I ran into problems with another contractor and Archadeck saved the day. They came and finished the project which had been abandoned! I am forever grateful to Rob Haislip and David Berryhill of Archadeck for their very professional approach and their responsiveness to my problems. David, John, Sonny and the crew were GREAT to work with. The quality workmanship and excellent communication were all I needed and got! Professional staff. Very organized and neat. Always accessible when questions arose. We were the last project of 2011. Dave did a wonderful job putting the project together despite the cold. Some minor design changes were needed, was ‘no problem’ with the combined group of workers. All worked nicely together under Dave’s guidance. The project came out perfect, above expectations. Working with this company was great. Very good communication, professional employees, beautiful finished product! Would definitely recommend this company. David Berryhill was truly outstanding to work with. He did an outstanding job from start to finish, including design, construction and consulting with us. After our pergola was complete he came back to address some warping of the overhead joists. One of the posts warped a year after installation and he came back out to replace it and some of the overhead joists. He never gave us any hassle or run around, didn’t try to delay any of our requests and always took the approach of trying to make us completely satisfied with our pergola (which he did). I would recommend him without any hesitation whatsoever to anyone considering a pergola, deck, patio, etc. Very professional and fast-working crew. We’re very happy with the end result. The whole project went well. Very happy with our porch and patio. The workers were extremely polite and professional. They were always on time and were flexible and offered suggestions when some of the plans were changed. It went great. Changes were made as we needed, the crew was on time and finished fast and we love the results. Had screened porch built one year! They did such a fabulous job, we had them come back to do a paver patio. Both crews were great – very professional. Highly recommended! Archadeck was on time and professional throughout the whole project. All questions were answered in a timely manner. We were so happy with everything. From my very first meeting until the end everyone was very professional and guided me as to what was best rather than try to sell the highest product. Beautiful deck and no problems at all. Carpenter was wonderful. It was on time and turned out great. We were very pleased with the overall design and construction… we would recommend Archadeck to anyone. Overall, the project went great! Everyone who worked with us was on time, helpful and extremely nice. The project went well. I am happy with the end product. The crew was very professional. Archadeck delivered everything as expected. Excellent communication, planning, flexibility and execution of our deck/patio. Would recommend them to anyone. Professional service and superior design. Great job, beautiful work, delivered as promised. The professional job from start to finish. I couldn’t be more pleased. Very pleased with the results. Kristen and Dave took the time to coordinate with landscaper schedule and my schedule. Everything came in on time. Working with the owners was great. Very happy with the patio results. Great job, very happy. Love the finished product! Kristen and Dave were from the beginning professional, friendly and listened to our needs. They know their business and provided great ideas. 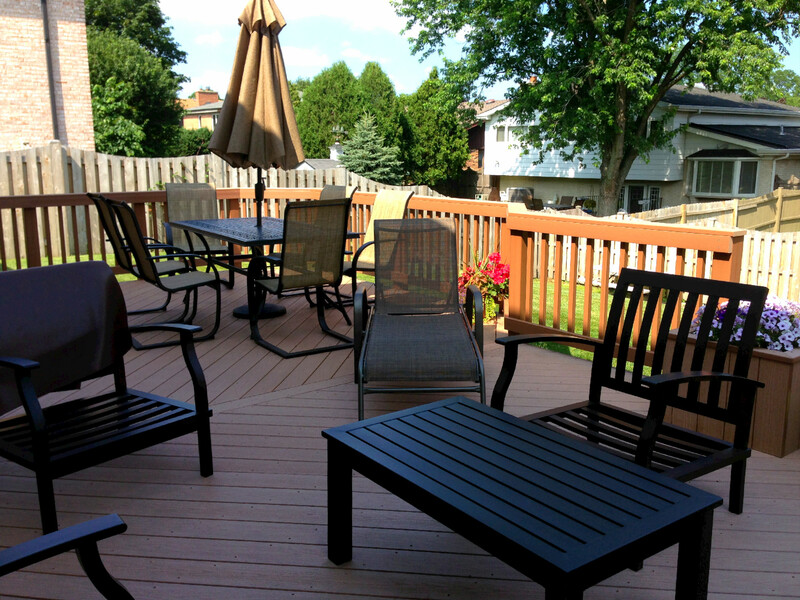 We could not be happier with the service and the overall result of our patio and deck! Excellent company to work with! 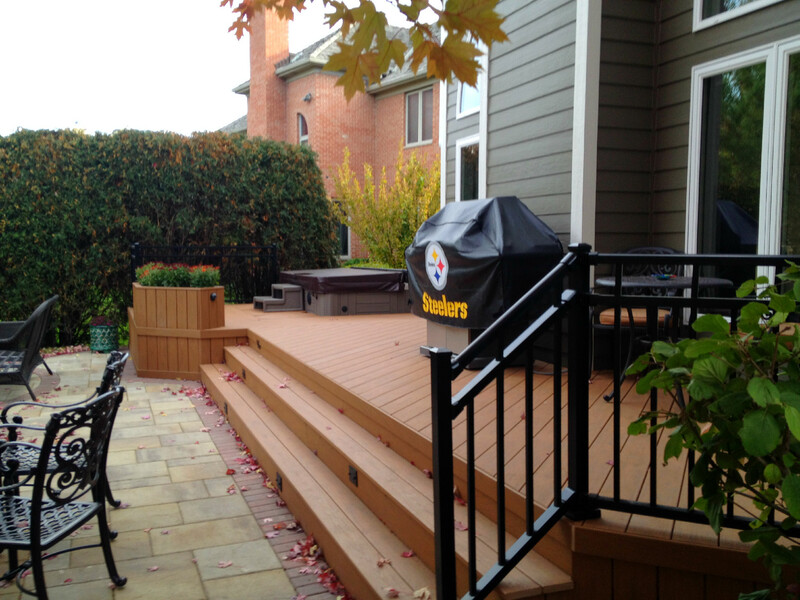 We were extremely pleased with our completed project with Archadeck. Everyone was very professional and easy to work with. We would highly recommend Archadeck! The team did a great job on connecting the height of the deck to flush with the patio door. I love my deck. Thank you. This project went great from start to finish. The final product looks great, we were kept informed every step of the way, and the project came in within budget and on schedule. We found Archadeck to be very professional, organized, and efficient. The project went well. Especially the friendly carpenter, who was very nice and accommodating. Archadeck was professional, thorough, and responsive to our questions and requests. We heartily recommend them for new or replaced decks. Great people. They said what they would do and did what they said. Excellent craftsmanship.